Acclaimed Paraflyte styling and quality. A single anchor at pedestal base supports the entire chair. 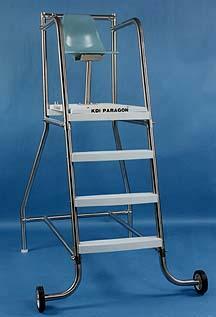 The vertical access ladder requires less deck space and does not need separate anchors. Pedestal Anchor furnished. Rear anchors and escutcheon plates not required. Platform Hieght above deck : 4' 6"
Seat Height above deck: 6' 0"
Combination ladder risers and guard rails made from .065" X 1.9" O.D. Platform are constructed of a laminated wood, coated with fiberglass and polyester resin with a non-slip texture. 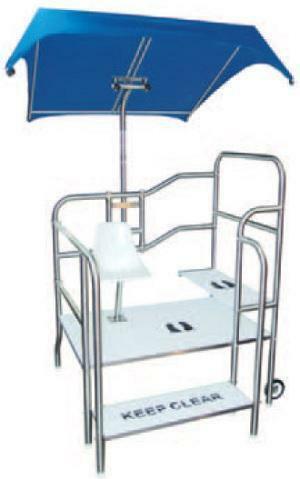 Furnished with umbrella and rescue tube holder. Available in 4-step, 3-step and 2-step models to fit all chair needs. All chairs are light enough to be easily lifted by one person. but you can also choose to add portablity with optional wheels for added mobility. The Optional Wheel kit includes 4" whhels with mounting brackets and hardware. 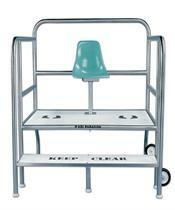 Griff's Guard Stations feature front entry, elevated viewing station, easy access, and non-skid surface. A wide front step provides additional station and brings the guard closer to the pool edge. 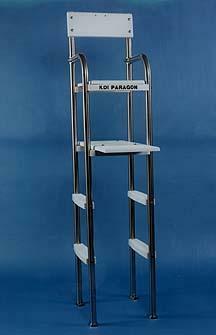 Heavy duty wheels allow convenient, easy portability. Stainless steel and fiberglass construction assures long lasting and troble-free service. Provides three positions for better viewing. Platform size is 39" x 60" and is 24" above the deck. Front step is 14" x 43". Elevated step is 14" x 40" and 36" above pool deck. Includes self-instructional CD's for guard training. Shown with optional Sun Shade Upgrade. Griff's Guard Stations feature front entry, elevated viewing station, easy access, and non-skid surface. Heavy duty-wheels for convenient portability. Stainless steel and fiberglass construction assures long lasting and troble-free service.This station has a wider access for easy entry. Platform size is 39" x 60". Step is 14" x 57". Platform is 24" above deck. A wide front step provides additional station and brings the guard closer to the pool edge. Stainless steel and fiberglass construction assures long lasting and troble-free service.Higher viewing angle for greater visibility. Bench size is 14" x 40" and 4' above pool deck. Platform size is 40" x 40" and is 33" above pool deck. Access steps are 14" x 40". 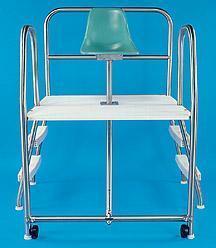 The Paraflyte Lifeguard Chair with Rear ladder is recommended for general use. 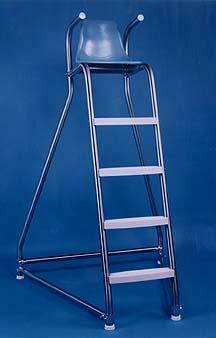 The sloping rear ladder with flared guard rails provides easy access to the platform. The horizontal rails provide protection and serve as arm rests. A molded plastic seat, located 6' above the deck, is capable of a full 360 degree swivel and has a stainless steel sloping support. 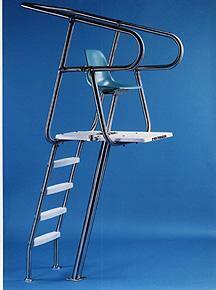 Two access ladders allow the lifeguard to dismount quickly and safely from either side. Two guards can each stand in an elevated position for unbroken surveillance during guard change and relay of instructions. 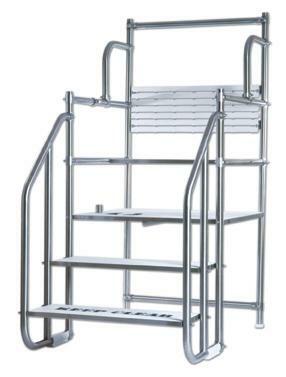 Ideal for pools with limited deck space. Convenient access from both sides allows lifeguard change with uninterrupted coverage. 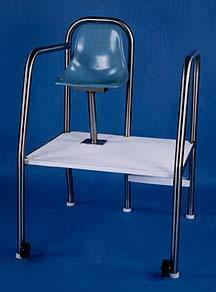 Portable, solid stainless steel frame, 360° swivel seat is mounted on a 4' x 4' non-skid, fiberglass platform. Access steps are 26". Seat height is 54" from deck. Platform height is 36" from deck. Wheels allow for easy relocation. Includes umbrella and rescue tube holder. Engineered especially for busy aquatic facilities and water parks. Access from both sides allows uninterrupted guard change. Sloping steps allow quicker dismount. 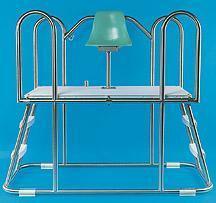 Portable, solid stainless steel frame, 360° swivel seat mounted on an extra large 60" x 40" non-skid fiberglass platform. 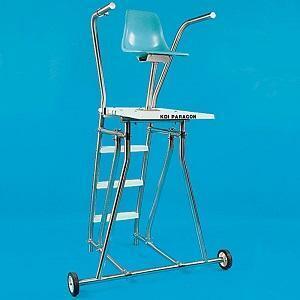 Utilizes 26" steps. Seat height is 54" from deck. Platform height is 36" from deck. 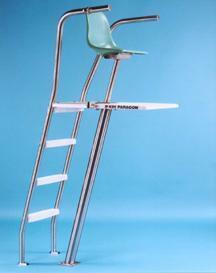 Stand includes umbrella and rescue tube holder. 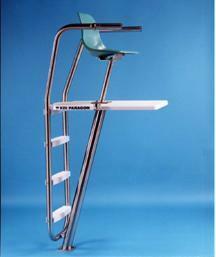 Designed for those pools where the lifeguard chair must be anchored, yet still be capable of being readily moved. 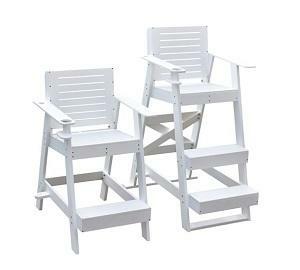 (In Sunbelt states chair might be moved to opposite sides of the pool each day to keep the sun out of the guard’s eyes.) The rear legs are set into sockets anchored in the deck, while the front legs with 7" diameter wheels allow for easy relocation. 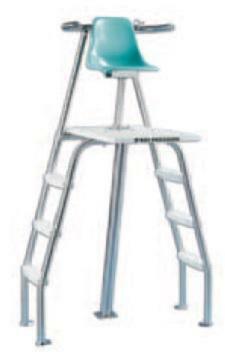 Ladder has 19" steps. Furnished with two pairs of anchor sockets (for two locations), additional sets must be ordered separately.